France’s BNP Paribas have updated clients with their latest foreign exchange projections. We remain constructive on the USD, but for the currency to recover meaningfully, we will likely need to see more evidence that the surge in manufacturing and consumer sentiment reported in Q4 is translating into actual activity improvement. The GBP will remain in focus heading into the ruling on Brexit from the Supreme Court, expected on Monday. The government is generally not expected to win this appeal, but we think the significance of this ruling has diminished since last month’s parliamentary resolution supporting the Q1 timeline for Article 50. We continue to believe the GBP is trading near levels reflecting a worst-case scenario for trade and capital flows, and therefore expect long-term-oriented investors to be buyers below GBPUSD 1.20. For a more detailed report on Sterling, please see here. With markets previously pricing no risk of rate cuts near-term and chance of rate hikes later this year, the adjustment in CAD rates has been significant. 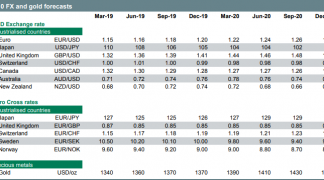 We believe there is scope for similar adjustments in pricing in other commodity bloc curves and we remain generally bearish on commodity bloc FX vs the USD. Bearish JPY remains one of our highest conviction views for 2017 and we continue to target USDJPY at 128 by the year end. This is our top trade idea for 2017.